How does one sewing mama say thank you to another sewing mama? By sewing something, of course! 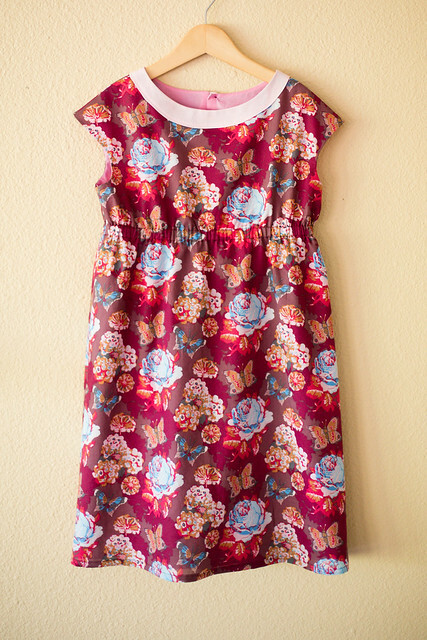 So when I wanted to say thank you to Rachel for all of her help, I decided to make a dress for her daughter. Which dress? The roller skate in voile, naturally. 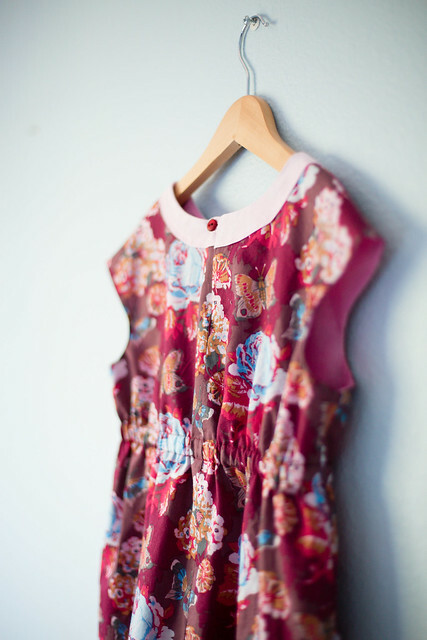 Rachel told me her daughter likes pinks, purples, and reds as well as girlish prints. So Indigo chose the fabrics and we kept it a surprise. It was a good opportunity to take extra care with the details and learn a few things along the way. I added length to the dress the correct way, rather than just adding a few inches willy nilly, eyeballing it. I also wanted to wow her by matching the print along the back seam. Rather than google how to do it, I tried to figure it out myself. I have a hard time wrapping my brain around such things. Trying something new intimidated me a little, because it had the potential to look super cheesy if I messed it up. My mental gymnastics weren't quite up to snuff and it ended up being off by about a 1/2 inch horizontally but spot on vertically. I think getting it right vertically was most important, though. I accidentally deleted the photos of the back seam, but if you look at the blue moth near the bottom of the above photo you can see it's pretty close. Now I'll know how to do it for next time! I loved the addition of the yoke this time. I left out the notch (inspired by Gail here). I took my time on the yoke, following Liesl's instructions exactly and was pleased with how smooth the curve was. I definitely wouldn't cut any corners on that step. THIS is adorable! Simple lines and beautiful fabric! so pretty! and what a nice gesture! Lovely! What a lucky girl! Oh, Rachel, I am so behind on my reading and just found this. You worked so hard and were so thoughtful! It is a gorgeous dress. Couldn't be any more perfect!